The venue for the 2017 UEFA Champions League final, scheduled for Saturday 3 June 2017, was confirmed by the UEFA Executive Committee on 30 June 2015. CSKA Moscow entered group stage as russian champions. Rostov into third qualifying round as runners up. Florentino on the UCL format being changed: "It's very difficult at present, but it's a possibility in the future I'm sure." Florentino: "We have asked that UEFA change the format of the UCL because I believe that the current version is rather worn out." Last edited by AKKU1221; 06-01-2016 at 01:24 AM. Telegraph: Amendments on the table range from tweaks to UCL’s entry criteria to the introduction of a fully-fledged European Super League. Telegraph: #UCL possible format change could include playing matches on Saturdays rather than midweek to appeal to Asian & American viewers. Last edited by AKKU1221; 06-01-2016 at 01:22 AM. Last edited by AKKU1221; 06-01-2016 at 01:23 AM. • Construction on the venue, located on the site of the old National Stadium, began in 1997. 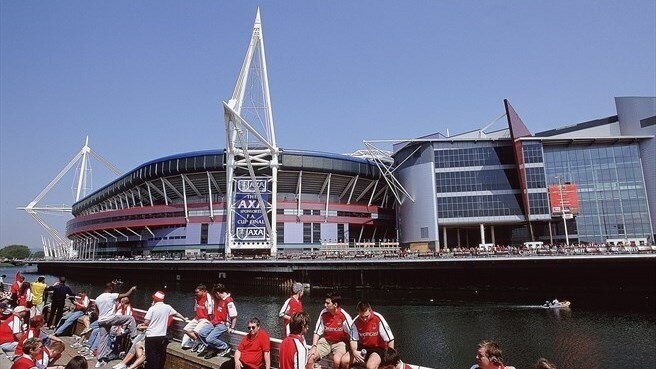 Despite being only three-quarters complete, the arena hosted its first match in June 1999, the Welsh rugby side recording their maiden victory against South Africa. • Staged the FA Cup final for a six-year spell from 2001 to 2006 with Wembley undergoing redevelopment. Arsenal FC lifted the trophy three times in the stadium and Liverpool FC twice. • Also held the finals of other English cup competition's during Wembley's facelift and became notorious for an 'away team' curse. The first 11 major cup finals were all won by the side occupying the home dressing room. • The stadium is equipped with a retractable roof, comprising two sliding 400-tonne sections which take 20 minutes to open or close. It is the second largest covered stadium in the world, behind Cowboys Stadium, Texas, United States. 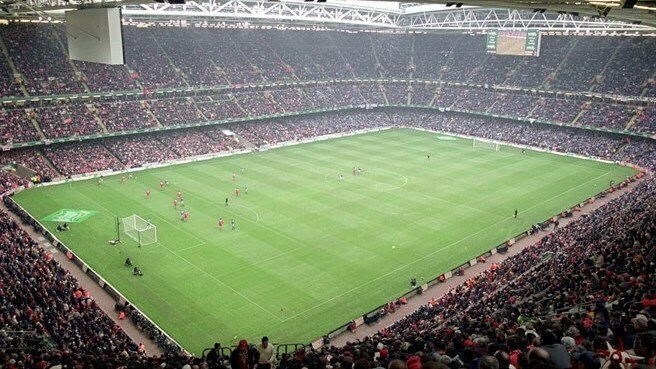 Wales' iconic home of Welsh rugby is to go back in time and be renamed the â€˜National Stadium of Walesâ€™ for the Uefa Champions League final. 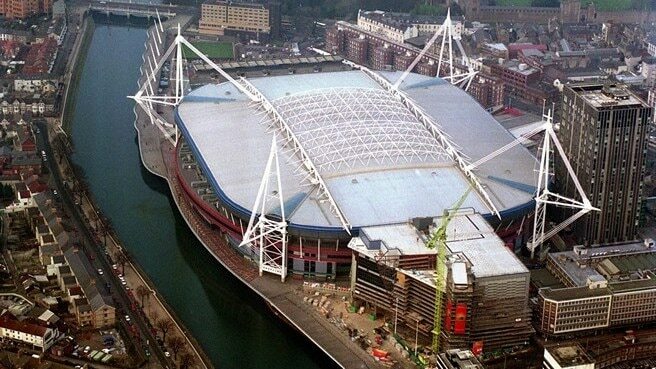 The move mirrors the National Stadium title the old Arms Park used to have before it was rebuilt as the Millennium Stadium in 1999. 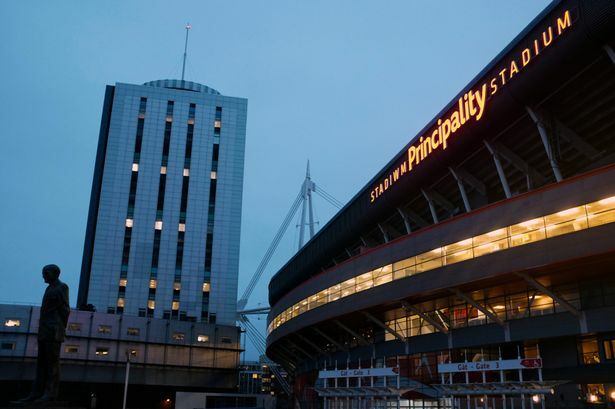 Earlier this year, the 17-year-old Millennium was renamed Principality Stadium in a multi-million pound sponsorship deal struck by the Welsh Rugby Union. 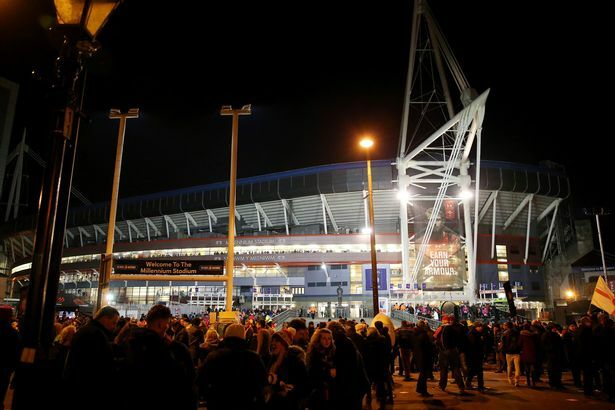 But Uefa have told the FA of Wales that the 74,000-seater ground cannot have a commercial title when it hosts the Champions League final next year. Uefa regulations on the matter for their showpiece match are quite specific and they spelt out the ground rules when the FAW and WRU linked up together to bring world football's biggest club match to Cardiff. It will mean the massive Principality Stadium sign on the front of the ground will be covered in the week building up to the game. More than a billion people are expected to tune in from every corner of the globe to watch the Champions League final, which takes place on June 3, 2017. The FAW announced what the ground will be known as in a press release issued to celebrate the official one year countdown to the big match. They say: "For commercial reasons, the stadium will be officially referred to as the â€˜National Stadium of Walesâ€™ for the staging of UCL Final 2017. 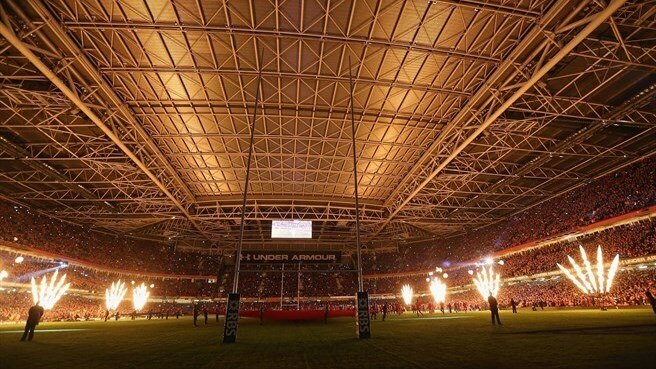 "The name â€˜National Stadiumâ€™ dates back to the 53,000 capacity National Stadium, Cardiff Arms Park which hosted Welsh rugby internationals and other events through to 1999, when the iconic Millennium Stadium opened its doors to host the Rugby World Cup." Wales' football team also played at the old Arms Park, before following the rugby side into the Millennium. More recently, they have made Cardiff City Stadium their home. FAW chief executive Jonathan Ford, who has just returned from the Real Madrid versus Atletico Madrid final in Milan, said: "The 2016 final delivered an estimated economic impact of Â£45m to the city of Milan. "The atmosphere across Milan was incredible and one we eagerly look forward to replicating in Cardiff next year.